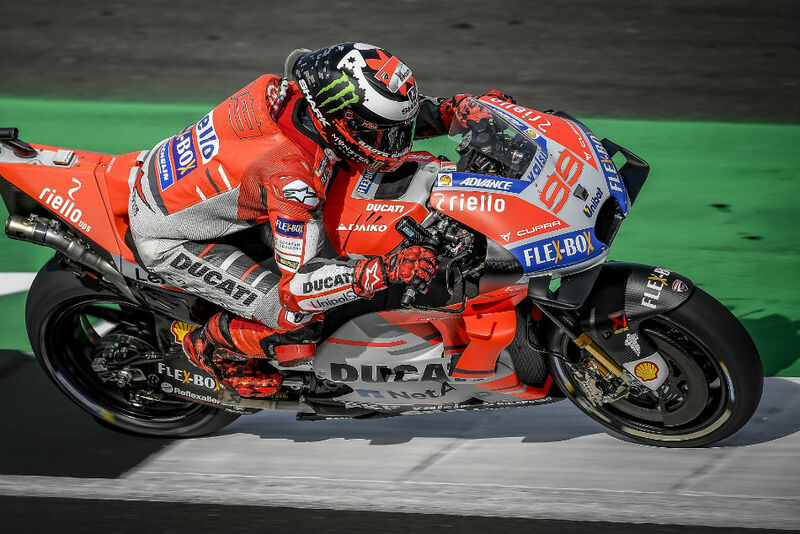 Jorge Lorenzo of Ducati Team will start Sunday's Aragon MotoGP on top after sealing his third consecutive pole position of the season in style, snatching Saturday's honours from team-mate Andrea Dovizioso by 0.014 seconds as the Ducati duo overhaul championship leader Marc Marquez (Respol Honda Team) in Q2. It was third place Marquez who came out the blocks quickest though, immediately clocking a 1:46.974 - the quickest lap of the weekend - on his first flying run, with Lorenzo 0.110 behind and Cal Crutchlow (LCR Honda Castrol) on the provisional front row. The mind games then appeared as the riders came out to try and better their times. Dovizioso had Marquez lurking in his shadows as the top two in the championship played cat and mouse, which led to both backing out of flying laps as everyone apart from Alex Rins (Team Suzuki Ecstar) and Jack Miller (Alma Pramac Racing) scrapped their opening second-run circulations. This meant it all came down to a one-lap dash, with Maverick Vinales (Movistar Yamaha MotoGP) leading a freight train of eight riders, as Marquez clung onto the tailpipes of Dovizioso. The two were setting the timing screens alight but heading into Turn 12, the Honda rider slightly out-braked himself - losing a potential pole lap. Meanwhile, despite having to manoeuvre past Alvaro Bautista (Angel Nieto Team) at the same corner, 'DesmoDovi' went fastest by 0.065 to grab provisional pole, but team-mate Lorenzo was on the prowl. Heading out slightly later than the rest of the field, the 'Spartan' put the hammer down and snatched pole by 0.014 - his fourth of the season and his fourth successive front row in Aragon. This bumped Dovi to P2 and Marquez to P3 as the trio spearhead the grid together for the first time since the Austrian GP - and we know what happened there. Crutchlow threatened the front row but a crash at Turn 12 on his final flying lap ended his chances of a third front row start of the season - P4 for the Brit and just 0.265 off Lorenzo. Fifth on the grid went to Andrea Iannone (Team Suzuki Ecstar), his best starting spot since the Catalan GP, with Dani Pedrosa (Repsol Honda Team) securing his best qualifying position since Jerez in sixth.